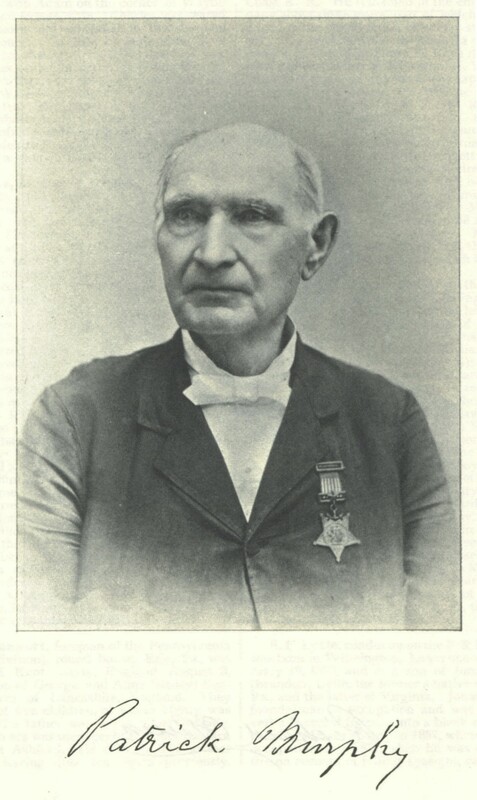 It has been a while since the site has looked at one of the Irish-born Medal of Honor recipients from the American Civil War. Issues regarding recording of nativity means there is, as yet, no definitive total number for Irish-born men who earned this award during the conflict. Each time I investigate the figure evidence emerges which adds further names to the list. You can explore the names of 146 of the men I have compiled here; since it was last updated I have come across more probable Irish-born recipients. Today’s guest post looks at one of the naval recipients of the award, Waterford’s Patrick Murphy- a man who after the war would become embroiled in events surrounding the Fenian Invasion of Canada. 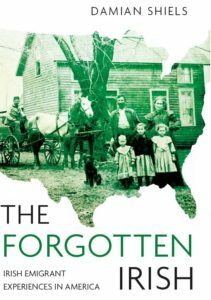 The post author is James Doherty, a Waterford native who has carried out extensive research on that city’s military past and Waterford involvement in conflicts such as the American Civil War. James has been at the forefront of efforts to see Irishmen and women impacted by the American Civil War recognised in Ireland, and also played a key role in the creation of the 1848 Tricolour Celebration events in Waterford City. 1844 saw Murphy in Erie, Pennsylvania where the United States government were commissioning the USS Michigan to patrol the Great Lakes. Murphy gained employment during the construction stage of the Michigan and was employed as a seaman when she put to sea. In naval terms Murphy would have been considered a plankowner. A plankowner is a member of the crew who served on a ship when it was first commissioned. Being with the ship from the start gave the crew members bragging rights in that they ‘owned’ one of the main planks on the deck of the vessel. Historically in US naval tradition the plankowner or his widow could petition the Navy for a piece of the deck planking when the vessel was decommissioned. Murphy had married his wife Bridget in 1845 and after the Civil War ended he returned to Erie. They had two sons; William died in infancy and James would later become an actor in Cleveland. Murphy had developed his own stake in the mercantile trade before the conflict, purchasing a schooner called the William Adair in 1853. He continued his interest in trade whilst serving in border patrol aboard the Michigan after the war. It was his service on the Michigan in 1866 that provided another notable event in Murphy’s life. 1866 saw the ill-conceived and ill-fated Fenian invasion of Canada. The Fenians hoped to take part of Canada and use it as a bargaining chip with the British Government to secure the independence of Ireland. Although the plan seemed far-fetched on the ground the Fenians had many advantages. They were well armed and veterans of the Civil War and the enemy they opposed (mainly Canadian militia) had never fired a shot in anger. Their plan was that a force of over a 1000 men would cross into Canada and take and hold ground near the town of Ridgeway. It was 3pm the next day before the steamer finally set sail, preventing Fenian reinforcements from crossing the Niagara. After a brief skirmish the Fenian raid fizzled out and its commanders realised the situation was hopeless. Its leaders faced arrest and the Michigan escorted the rank and file Fenians back across the Niagara River. The level of Murphy’s complicity in delaying Michigan’s departure is impossible to ascertain. This blemish on his military record didn’t seem to affect his career however, as he was awarded his Medal of Honor in 1870. Murphy retired from the Navy in 1885 and was an active member of the GAR. Boatswain Patrick Murphy passed away on 1st December 1896. 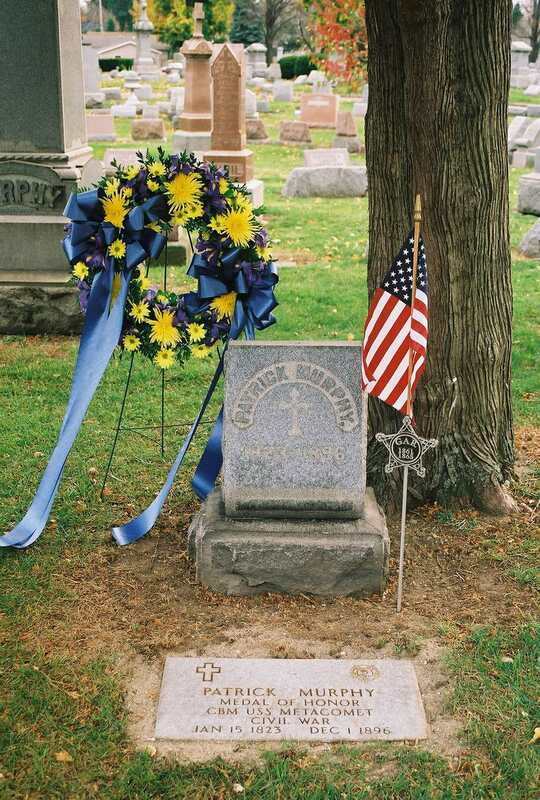 In 2009 Murphy’s grave was re-dedicated and given the appropriate Medal of Honor marker. The Battle of Ridgeway and the life of Patrick Murphy are remembered in the Erie Maritime Museum. Thanks to LindaBolla of the Maritime Museum for help in preparing this article. Dictionary of American Naval Fighting Ships Online. Bohen, Timothy 2012. Against the Grain: The History of Buffalo’s First Ward. Nelson, S.B. 1896. Nelson’s Biographical Dictionary and Historical Reference Book of Erie County, Pennsylvania. Rogers, Bradley A. 1996. Guardian of the Great Lakes: The U.S. Paddle Frigate Michigan. United States Government 1973. Medal of Honor Recipients 1863-1973. Many thanks for the comment. Was he a relation of yours? Nice article. I love when you have found photos to post, too! Thanks for the comment! James has spent quite a bit of time researching him! Another good man, that Murphy. Damian’s, is he buried in Waterford? I’ll be in Galway then Cork this coming July and may visit the rascal’s site. Pat Murphy is buried at Trinity Cemetery, Erie PA, USA. Please do visit the Erie Maritime Museum if you are in the neighborhood. We have what remains of USS Michigan on exhibit, and I’m sure we can direct you to Pat Murphy’s gravesite. I would suggest you visit any time except this Winter! Many thanks for the comment and for passing on this information to us. I for one certainly hope to be able to visit someday! He isn’t (see Linda’s reply). Very few of these men ever came back to Ireland. There are some sites in Waterford to see though, such as the memorial to Patrick Clooney in Ballybricken Graveyard and the sites relating to Thomas Francis Meagher for example- well worth seeking out!